The Sun Rubber Company made rubber squeak toys and dolls from 1923 in Barberton, Ohio USA until they closed their doors in 1974. Dolls are usually marked on back Sun Rubber Co. Viceroy Manufacturing Unlimited of Toronto, Canada sold similar named dolls of Sun Rubber's. Shown at left: ca. 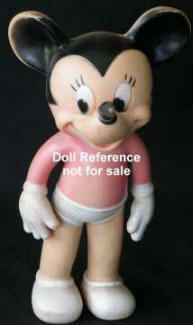 1946 Mickey Mouse doll, 10" tall, rubber squeak toy, one piece rubber body, painted facial features, has molded painted clothing and shoes. Doll marked: Sun Rubber Co. Sun Rubber made other Disney character dolls, too. See below for more Sun Rubber dolls identified. 1923-1930s Quintuplets dolls, 4 3/4" tall - we have never seen these dolls, but a visitor has sent an e-mail and stated the Sun Rubber Company made a set of these dolls. 1937+ Comic characters, 10" tall, rubber dolls with molded on clothing; Popo doll, Silly doll, Minnie Mouse doll (see above for Mickey Mouse). 1950 Sunbabe doll or Sunbaby doll, 11-13" tall, baby type drink and wet doll with painted eyes and molded hair. 1950s Squeeze Dolls, 6-8" tall, one piece rubber body, molded clothes, designed by Ruth E. Newton; Bonnie Bear doll, Happy Kappy doll, Chunky doll or Rompy doll, Wiggy Wags doll. 1953 Betty Bows doll, 11" tall, rubber jointed body, molded hair, drink and wet baby doll. 1954 Baby Bannister doll, 18" tall, all vinyl baby doll, drink and wet, based on the baby photo's of Constance Bannister. Marked on neck; Constance Bannister on back Sun Rubber Co.
1956 Sun Dee doll, 17" tall, baby drink and wet doll with a squeaker. 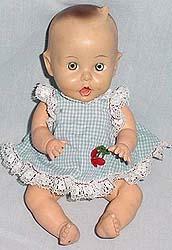 1957 Sunny Tears doll, 16" tall, vinyl doll, blue eyes, rooted hair, drink and wet type with open mouth. 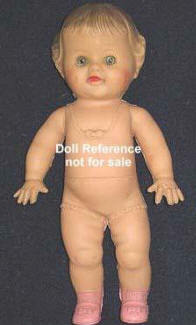 1956 Gerber Baby Doll, 11" tall, doll is marked: Gerber Baby Gerber Product Co on head. 1955 Gerber Baby Doll, 11" tall. Unsure if shown in original clothing. 1949 Amosandra doll, 9 1/2-10" tall, all soft rubber black doll, jointed body, molded painted hair, painted or glassine eyes, open mouth, drink wet doll, marked on head Amosandra © Columbia Broadcasting, Inc. Marked on back: Designed by Ruth E. Newton, MFG. by the Sun Rubber Co. Barberton OH U.S.A. Pat. 2118682 Pat. 2160739. Box states "The lovable baby from the CBS (radio) program Amos and Andy, No. 10026, Amosandra is a trademark of Columbia Broadcasting Syndication, the doll is an Amos n' Andy article conceived by T. W. Smith Jr., designed by Ruth E. Newton and manufactured by the Sun Rubber Company under a design copyright by Columbia Broadcasting System, Inc." Amosandra is the baby daughter of Amos. Photo courtesy of Cattsmule - great doll!! ca. 1950s Louis Marx also made a mechanical creeping Amosandra doll. ca. 1953 Tod L Dee doll, 10" tall, a thrifty first doll, all soft rubber stuffed one piece body with molded flesh colored onesie, unionsuit or underwear, some molded clothing is also painted, molded shoes, molded painted hair, stationary plastic eyes, open mouth, drink and wet doll. Dolls can be found in 1957 Sears catalog ads. There are also Tod L Dee, Tod L. Tim & Tod L Tot dolls in this series. Dolls marked: Sun Rubber Co.
Arrow Plastics made a similar competitor doll with molded onesie, sleeveless unionsuit, these dolls are marked on the neck with an A and a number. ca. 1956 Sun Rubber Chunky doll, 8" tall, rubber child type dolls; Chunky a girl doll or Rompy (or Viceroy's Ronny) a boy doll, with colorful molded clothing and shoes, painted facial features, squeaker doll, dolls can stand by themselves. Both Sun Rubber & Viceroy's dolls have Ruth E. Newton in the marking. Dolls can be found in 1957 Sears catalog ads. About 1957 the Sun Rubber Company began using vinyl to make dolls and squeak toys.